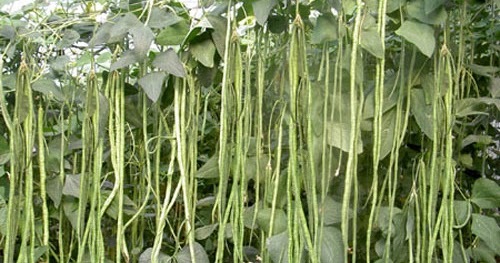 These are long, deep green ,stringless beans which grow up to 30-60 cm. 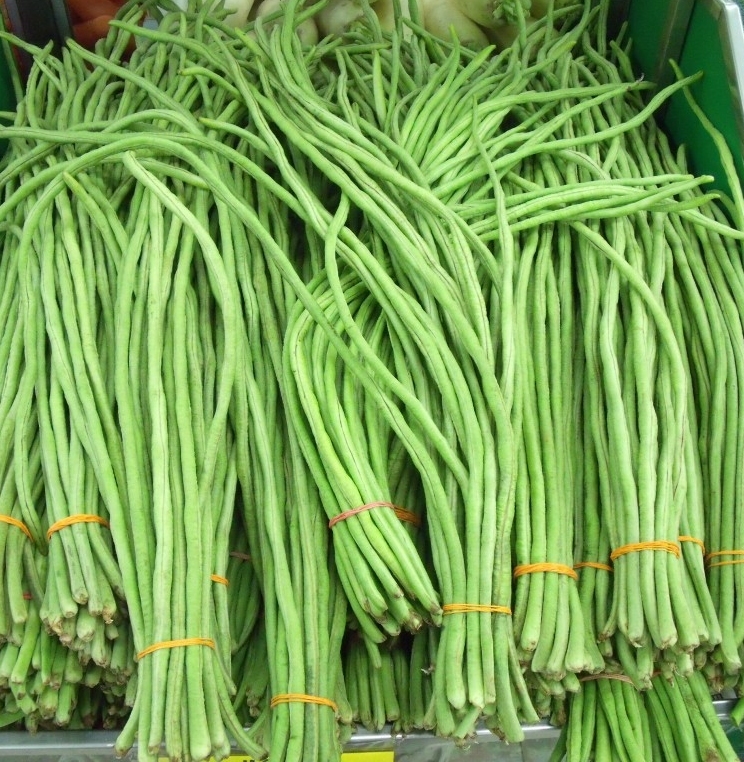 Cut in short lengths, they are used in stir-fries, curries and sometimes thai soups. The pods, which begin to form just 60 days after sowing, hang in pairs. They are best, if picked for vegetable use, before they reach full maturity. The plant is subtropical tropical and most widely grown in the warmer parts of Southeastern Asia, Thailand, and Southern China although will grow in milder climates. You almost need to check or harvest long beans everyday because they grow very quickly. Sometimes a few inches a day! The beans are planted as seed into slightly damp and warm soil with 1-2 seeds in each planting hole or “hill”. After sowing, water should be withheld until germination has occurred (3-5 days). The planting bed should be mounded if waterlogging during the season is expected. The planting is usually into single rows about 3 m apart with 30-60 cm between “hills”. The plants are encouraged onto trellises. 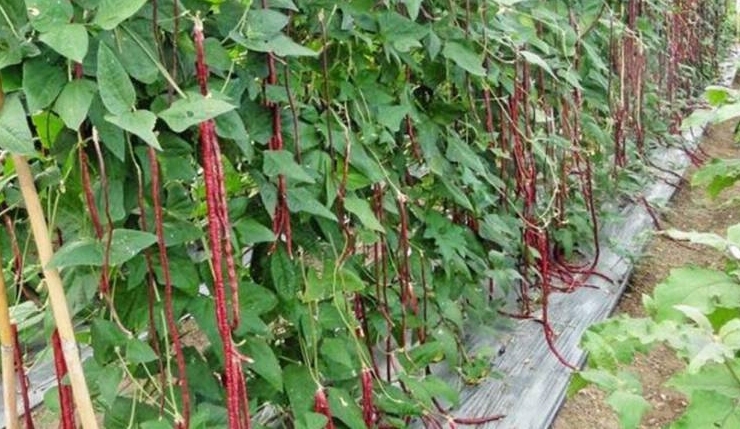 Long beans will benefit from extra organic matter added before planting via either a green manure crop or an application of animal manure. This organic matter should be well broken down before planting. Best cooked with oil either sauteed or shallow fried, delicious and crunchy, with a tight texture. 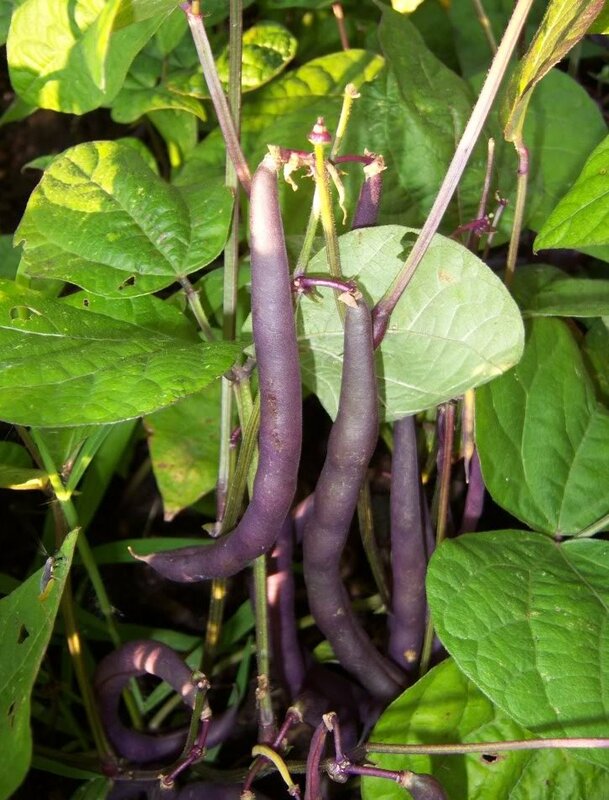 The purple beans look majestic and very appetising when included in a salad, or just a side dish. Like their green cousins they are best cooked with oil and either sauteed or shallow fried. The Winged Bean, or four angled bean is a legume whose young pods are a common vegetable sold in markets. The young tender pods are often stir fried with spicy prawn paste. The Winged bean is botanically known as Psophocarpus tetragonolobus. 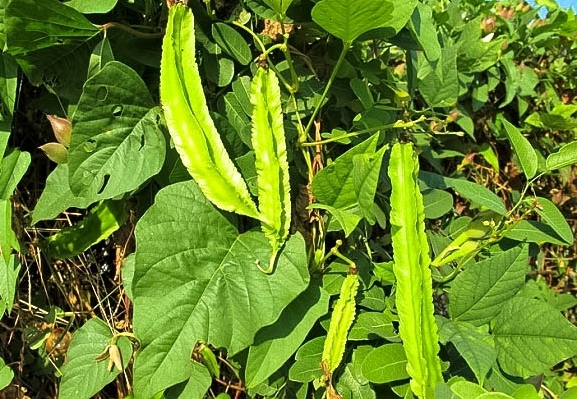 The plant produces pea-like beans with four winged edges. Almost every part of this unique plant is tasty and edible. The fresh young pods are similar to green beans with a chewy texture and a slightly sweet taste. When cooked, the leaves taste like spinach and the flowers like mushrooms. The firm-fleshed roots have a nutty flavor. This remarkable bean offers a high source of protein. It is outdoors in a garden with a large, strong trellis for it to climb. Winged Bean seed has a hard coat skin that may decrease and delay the seed germination, because water can not get into inside of seed. In many cases, seeds may have relatively low germination rate, 50-60%, if planted without any special treatment. Soak seeds in water for 1-2 days, some seeds will swell when absorbing water and some seeds may not swell at all due to the hard coat skin. Plant these swollen seeds into moist soil for further germination process and collect these unaffected seeds for special treatment as described below. The germination problem for these unswelled seeds can be improved by scratching with sand paper or by breaking with a shape nife on the hard coat skin at the furthermost location from the seed eye. This pre-seeding teatment will allow moist/water to get into the inside to trigger the seed germination process. A high germination up to 90% can be obtained. 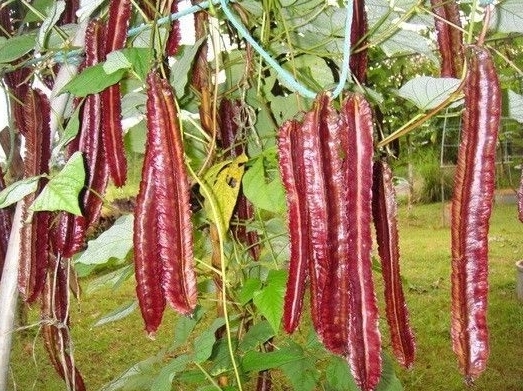 The beans are often used in a spicy salad (yum tua pu), google for recipes. The plant has a deep, fleshy taproot, the young stems are finely pubescent, and the leaves are tri foliates having a few shallow lobes, and also slightly pubescent. 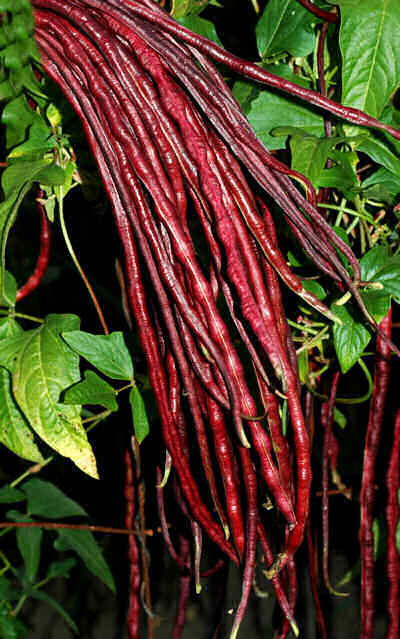 PurpleBush Beans are useful as a tropical forage crop in full sun, and can also be used to prevent soil erosion. It tolerates a wide range of soils and pH, and tolerates more salinity than other leguminous forage crops. It is well-adapted to drought by virtue of its taproot and pubescent leaves that reduce evaporation. Heavy frost causes dieback, but the plant re sprouts from the crown in warmer conditions.